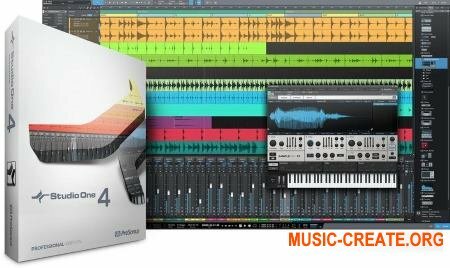 PreSonus Studio One 4 Professional v4 был разработан с простотой использования в своей основе. Он легко сочетает проверенную временем студийное качество с современным технологическим процессом, ориентированным на бит и луп, так что вы можете быстрее приносить музыкальные идеи в звуковую реальность. 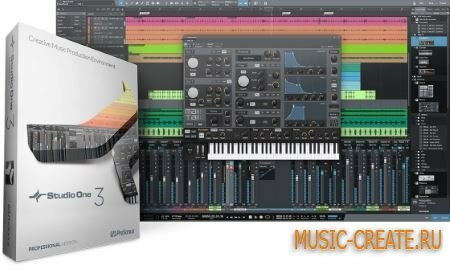 PreSonus has released a new maintenance update for Studio One featuring hardware support of their new 64-channel mixer, the StudioLive 64S, plus many other changes and fixes. Support for PreSonus StudioLive S-Series mixing consoles. [Browser] Added "Funk", "Soul", "Latin" tags to Style category. [Browser] Added "processed" and "riff" tags to Character category. [DAW Mode] Moving the master fader turns all of the Main meter LEDs off momentarily. Incorrect transposition in certain cases when audio is time-stretched. [macOS Mojave] Studio One stuck at "Starting External Devices..." on launch while certain gear wasn't connected. [macOS] Cmd+Drag won't remove plug-in. [Windows] Installer does not clear the factory templates folder. [MaiTai] On certain presets, switching Osc 1 to Sine stops audio. [Mixer] "Send" slot height resets when opening outputs pane. [Mixer] Changing the level meter scale won't refresh the side meter. [Mixer] Track focus is shifted when console view was closed and reopened. [Music Editor] Pitch selection doesn't follow when moving notes. [Music Editor] Some bold grid lines are missing. [Music Editor] Notes w/ velocity value "0" can be entered but "1" will be played. [Music Editor] isn't updated correctly at certain zoom levels, events seem to disappear. [Ripple Edit] Moving parts upstream sometimes causes overlaps. [Tempo Track] Scrolling horizontally won't update tempo node label(s) at certain scroll speed. Freeze on enabling Chord Follow on Presence XT instruments w/ Key Switches. Arrangement scrolls away from current track when navigating automation nodes with arrow keys. Automation glitch when using 'Undo' command after 'Move to Cursor'. Audio track muted when use mute solo in certain combination. Focus of "New Song" dialog is lost when mixer is still open. Touch events are delayed on the mixer controls. CD-Text "Genre" field truncated on writing DDP. In certain song templates, "Volume" and "Mute" automation is not correctly localized. Audio outside the bend range is altered. Track delay is inverted when Melodyne is involved. Tool Tips and Info Texts not available on screen-sharing via 3rd-party apps. MIDI on/off issues (e. g. sustain pedal) when plug-in delay is higher than 120 ms.
Certain songs with Sample One XT cannot be renamed. "Strip Silence" keeps unwanted parts. Inversions of 7th chords are not recognized. Musicloop import fails with multiple loops. Wrong note position when using pre-count in mix mode. Time signature is overwritten when drag 'n' dropped to destination bar. Potential crash when activating surround outputs in NI Kontakt. Нормальная прога. какой артист? поддерживает любые плагины. ..я ставил это и знаю..
выбросил из компа эту шнягу..
вновь поставил версию 3.5..вот там есть поддержка сторонних плагинов.